With more than 7,500 varieties of tomatoes, one has to know exactly what they want before deciding to grow. 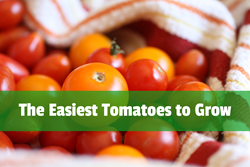 So no matter if it's to-may-to or to-mah-to, choose the easiest tomato variety. Cherry Tomatoes are the easiest tomatoes for beginners to grow. They produce crop after crop and have very few problems! Here are a few of the best. 1. Super Sweet 100 – The name says it all – these are sweet and easy. Just one plant can bear more than 1,000 tomatoes. Super Sweet 100s grow in long strands or clusters of more than 100 tomatoes. Thousands of tomatoes that are high in Vitamin-C will ripen by the end of the season. 2. Napa Grape – This classic tomato tastes and looks just like its bigger rivals, but has a higher sugar content than any other grape tomato. Known to be one of the tastiest tomatoes out there, the Napa Grape produces sweet tomatoes that taste yummy in salads or as snacks. 3. Golden Nugget – These sweet tasting tomatoes love cool weather and can withstand the heat. Looking more like tangerines than tomatoes, Golden Nuggets ripen early and produce lots of fruit. 4. Yellow Pear – Tangy, beautiful and tiny, Yellow Pear tomatoes look charming in salads or as snacks. A favorite of chefs, these dynamic tomatoes love to sprawl, so contain them with a cage or stake. 5. Sun Gold – These orange tomatoes taste like tropical fruit and thrive in hot, sultry climates. Grown in long clusters of 10-15 tomatoes, Sun Golds produce fruit well into fall. Plus, these cherry tomatoes can be grown in containers. Go forth, and grow! When organic gardening, be sure to feed tomatoes lots of Tomato-tone during the growing season. Looking for more info on tomatoes, such as growing heirloom tomatoes, hybrid tomatoes or non-red tomatoes, please visit the Organic Tomato Gardening Guide for more tips and tricks.